Fire boat response crews battle the blazing remnants of the offshore oil rig Deepwater Horizon. With these massive lease sales in the Gulf, the Trump administration is holding up President Obama’s policies with one hand to claim the environment and worker safety won’t be compromised, while slashing those same policies with the other hand and aggressively attempting to expand drilling. Environmental groups sued the Trump administration today for opening up more than 78 million acres of the Gulf of Mexico to offshore drilling without fully analyzing the risks to people, wildlife, and the environment. The lease sales targeted in the suit are the largest ever offered for oil and gas development in U.S. history. 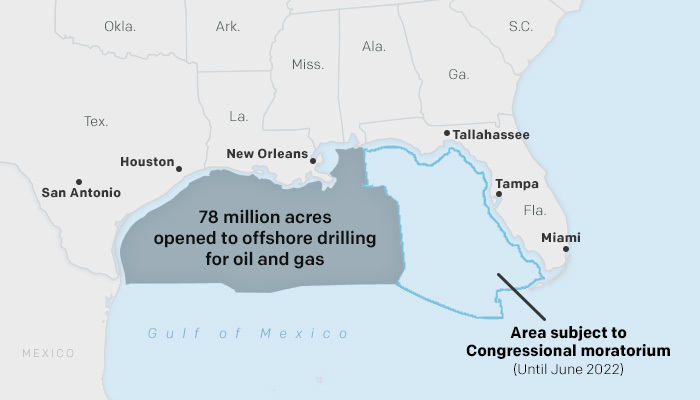 The agency is offering essentially all available, unleased acreage in the Gulf that is not subject to a congressional moratorium — everything but the continental shelf off the Florida coast. The lawsuit, filed by Earthjustice on behalf of the Gulf Restoration Network, the Sierra Club, and the Center for Biological Diversity, follows the Bureau of Ocean Energy Management’s (BOEM) announcement last week of its next lease sale on August 15, 2018. The suit challenges that sale and the March 2018 sale, which drew tepid interest but still sold 50 percent more acres than the previous lease sale in August 2017 at a significantly lower cost per acre. In a departure from past practices, BOEM is now offering essentially all available, unleased acreage in the Gulf that is not subject to a congressional moratorium (i.e. everything but the continental shelf off the Florida coast). The effect is to reduce competition for available blocks and to allow fossil fuel companies to acquire and hoard leases at rock bottom prices. Today’s lawsuit, filed in federal district court in Washington, D.C., challenges BOEM’s flawed analyses of the sales’ environmental effects, charging that they rely on incorrect assumptions about the safety regulations and royalty rates that would apply to the leases. BOEM based several of its conclusions on Obama-era policies, including the Clean Power Plan and the Well Control Rule, which the Trump administration is now rolling back or eliminating. Additionally, the lawsuit charges that BOEM significantly underestimates the degree to which each lease sale would affect overall oil and gas development in the Gulf of Mexico and the effects on global climate change. This is the second lawsuit Earthjustice has filed in the past month representing these same three plaintiffs challenging the Trump administration’s failure to account for environmental and safety ramifications of current and expanded oil and gas operations in the Gulf of Mexico. “With these massive lease sales in the Gulf, the Trump administration is holding up President Obama’s policies with one hand to claim the environment and worker safety won’t be compromised, while slashing those same policies with the other hand and aggressively attempting to expand drilling. Trump can’t have it both ways,” said Chris Eaton, Earthjustice attorney. “The Trump administration is turning over the Gulf of Mexico to oil companies so they can drill and frack with no regard for the consequences. Shortcutting environmental review puts people and wildlife at risk and will only push us deeper into the climate crisis,” said Kristen Monsell, legal director of the oceans program at the Center for Biological Diversity. “The Gulf is one of the most productive marine regions in the United States supporting many species of turtles, dolphins and whales as well as accounting for one third of the nation’s seafood catch every year. Commercial fisheries and coastal tourism alone generate more than $40 billion annually in the five Gulf states. After the BP drilling disaster, we cannot afford to loosen common sense safety measures while increasing risky drilling operations in the Gulf,” said Cynthia Sarthou, Gulf Restoration Network executive director. Read the complaint filed today. Read case-related to oil & gas industry’s impacts on endangered species in Gulf of Mexico.